As part of the MEDA conference in Copenhagen from 05.-07.09.2018, Joerg Zender und Simone Jablonski presented the MathCityMap system and the review process. During this, various tasks in Copenhagen’s city center were created. 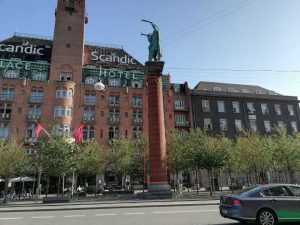 One of these tasks is about the statue at the city center and the red area. For this, the statue has to be modelled as a cylinder. With help of the measuring tape, the circumference can easily be determined and out of this the radius. The height can be calculated by means of the regular stones. All in all, Copenhagen was a great success for MCM!